The Far Eastern inspired exhibition, Eastern Poesia by native Delawarean Monique Rollins, will be the newest featured artwork in the Carole Bieber and Marc Ham Gallery at the Delaware Contemporary. 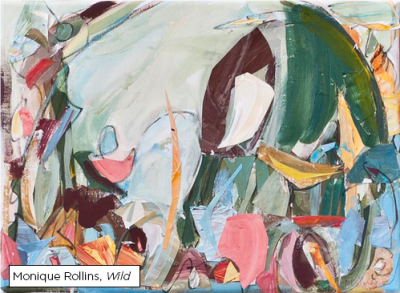 Monique Rollins&apos; abstract paintings and collages take on an expressive aesthetic appealing to memory, unconscious, and mood, reflecting her extensive experiences from traveling abroad. Every gesture, color, line, and biomorphic form predicts the artist&apos;s interest in human emotion. Margaret Winslow, Curator of Contemporary Art at the Delaware Art Museum, refers to that distinctive combination of biomorphic and abstracted geometric forms alluding to people, places, and events as "biogeometric abstraction." The abstraction in Rollins&apos; work also reveals a profound influence of Abstract Expressionism in the 1940s and 1950s characterized by large-scale, expressive lines and shapes. In contrast, Rollins&apos; large-scale work is not about grandiosity, but rather an intimate, personal expression of spontaneity and improvisation. Like the East Asian aesthetic, Rollins&apos; work often implies landscape while filled with energetic gestures and colorful shapes. Space and confident brushstrokes give way to "breathing room," negative spaces that lend pause, reverie, and stillness, while authentically communicating a visceral relationship. This exhibition, as part of an East/West cultural exchange, will be traveling to China and sites across the eastern seaboard. Monique Rollins received her BFA from Syracuse University and her MFA from The Pratt Institute. Her work has been selected for numerous solo exhibitions across the globe, and can be found in public and private collections across the eastern seaboard and abroad. Rollins&apos; exhibitions include Metroquadro Gallery in Rivoli, Italy, Emerge Art Fair in Washington DC, Art Basel Miami Context, Andre Zarre Gallery in New York City, the Beijing American Center in Beijing, the National Museum of Taras Shevchenko in Kiev, Ukraine, and a solo show at Art Central, Hong Kong. Her works can also be viewed at numerous sites throughout the city of Wilmington, Delaware. The Delaware Contemporary is a non-collecting contemporary art museum and a dynamic gathering place for exploring new ideas at the intersection of art, design, and technology. The Delaware Contemporary&apos;s compelling exhibitions and innovative educational experiences inspire the infusion of art into daily lives. Founded in 1979, The Delaware Contemporary presents over 25 exhibitions annually of regionally, nationally, and internationally recognized artists that explore topical issues in contemporary art and society. More than 25 artists rent our individual studios and exhibit regularly within the museum galleries and throughout the region. The Delaware Contemporary presents a variety of educational and outreach programs, integrating contemporary arts into the public school curriculum, and artists&apos; residencies that feature collaboration with underserved community groups. The museum is housed in a renovated industrial building at 200 South Madison Street in the heart of the growing Riverfront Wilmington.